The memorial consists of a steep faced lectern shaped piece of granite with a round on flat top. The sides and base are rusticated and an ornate bronze plaque is attached to the smooth granite face. An American Eagle with spread wings is at the top of the plaque. The logo for Dallas Furniture Company appears above the inscription between the years 1941 and 1944. The monument honors the 36 employees of that company who served in World War Two. A brochure printed by the High Point Convention and Visitors Bureau says the memorial was given to the city by Sanders “Slim” Dallas, Sr. It is uncertain when the plaque was originally made and dedicated but it was moved from a yard in nearby Jamestown in 2004. A small plaque placed at that time said the memorial was donated by Mr. and Mrs. R. Dwight Yarborough. Dallas Furniture ceased manufacturing in the early 1960’s. 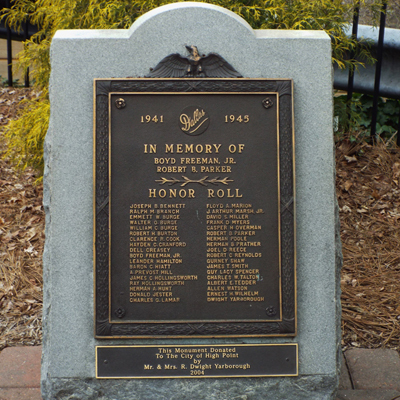 The marker stands on a brick plaza, or, Memorial Park, located at the intersection of N. Main Street and E. High Avenue. Other memorials include Revolutionary War Patriots, African American Gold Star plaque, Veterans Memorial, WWI Doughboy statue, and POW/MIA plaque. On the corner across E. High Street is a plaque to General Maxwell Reid Thurman. Across Main Street at the restored High Point Train depot is the Plank Road Foreman statue and “High Point” marker. 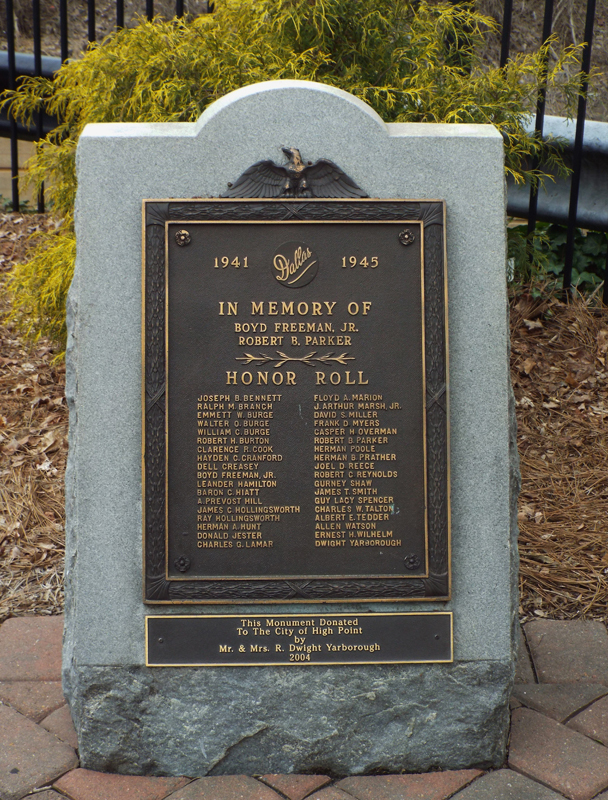 Bushes and trees adorn the brick plaza where the World War Two Honor Roll marker is located.